Once there was a play—and a theater was created to present it. That’s part of the story behind the establishment of New Yiddish Rep five years ago. 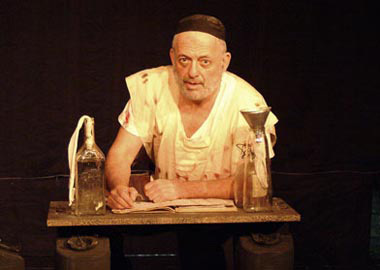 David Mandelbaum, New Yiddish Rep’s founding artistic director, was looking for a venue for Yosl Rakover Speaks to God, a play he had adapted from a book of the same name by Zvi Kolitz. “I didn’t succeed, so I did it on my own,” he says. That kind of faith might apply to his belief that there is enough room and interest for another Yiddish theater in New York City; Mandelbaum himself is a veteran actor of Folksbiene (see story). “It’s good to widen the horizon,” he says. His 50-minute dramatic version of Yosl Rakover was staged by New Yiddish Repertory in 2007 and given a repeat performance last April for Holocaust Memorial Day. 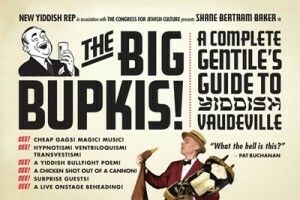 He describes NYR as a black-box, intimate type of theater with a focus on the “serious side of theater.” But not humorless; one of its productions is Big Bupkis: A Complete Gentile’s Guide to Yiddish Vaudeville, staged by veteran Yiddish actor Shane Baker (who is not Jewish). Blending humor and drama is Waiting for Godot, which will have its world premiere in Yiddish in Fall 2012; the theater has signed an option for a new translation and the exclusive right to produce this absurdist masterpiece. In Spring 2013, an interactive adaptation of S. Anski’s Yiddish classic, The Dybbuk, follows. One of New Yiddish Rep’s goals is to find a permanent home; so far the company has been itinerant—having performed at the Actors Temple; Workmen’s Circle; the Sixth Street Community Synagogue; the Jewish Community Center of the West Side; and, more recently, at Temple Beth Emeth in Brooklyn. New Yiddish Rep is open to shows in Yiddish or English, or what is known as “Yinglish.” “There is a need to present compelling theater, whatever the language. We want to shy away from nostalgia,” Mandelbaum says. But music will be a part of New Yiddish Repertory. April saw a concert by Anthony (Mordechai Tzvi) Russell, an African-American classical singer of opera and lieder performing Yiddish art songs. In May, Toronto actor, singer and producer Mitch Smolkin performed a blend of the Yiddish and the American Songbook in his show “Rexite the Wunderkind,” based on his new album.